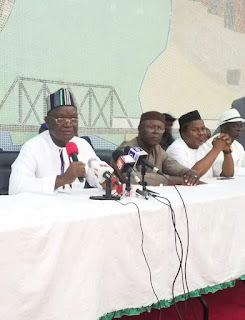 Benue State Governor, Samuel Ortom has directed the immediate renaming of the LGEA Primary School, Ogene -Amejo in Edumoga, Okpokwu local government area of the state after 13-year old Miss Ochanya Ogbanje who was reportedly raped to death by her uncle and his son. The Governor who announced the decision while briefing newsmen at the Benue Peoples House Makurdi, said the action was to immortalize the late Miss Ochanya considering the circumstances that led to her death. He also directed the State Universal Basic Education Board, SUBEB, to carry out massive renovation work on the primary school to accord it a befitting standard. Governor Ortom expressed the hope that when the Universal Basic Education Commission, UBEC, eventually releases its counterpart contribution to march the state government counterpart funding of N3.3 billion already deducted at source from the last tranche of Paris Club refund to the state, it would help to further improve infrastructure at the primary education level. He urged Benue people to keep faith with the PDP presidential candidate, Alhaji Atiku Abubakar whom he described as a man with the private sector background rich enough to take the nation to greater heights. Governor Ortom while reacting to the release of Alhaji Aliyu Tershaku by security agents, said he has been vindicated by the development, stressing that up till the time of the media interactive, he had not received any briefing on circumstances that led to the release of the former head of Livestock Guards. He thanked the people of the state for standing with him in times of challenges, pledging to continue to render greater services to them.